Lately, I've not been receiving much work online for my cat blog so I've been killing time playing my fave Free Online Casino games. You can never go wrong with a little casino fun and some of the Best Online Casino games can easily help me forget any worries including not getting paid opportunities for my cat blog. If you're into casino fun like me, you might want to check out Online Spot Casino, which is the largest online casino directory. Featuring a comprehensive list of the best Online Casino Reviews, exclusive bonuses, casino games rules and strategies and so much more; all the information you need to make your Casino Night fun and fruitful can be found right here. Don't forget to check out the Top 10 online casinos voted by players too. Anyway, besides casino games, I am still very much into my addictive time-management games and am now hooked on Farm Frenzy 3 American Pie. If you're a Mariucan on Twitter, you probably noticed the tweets of me having some fun playing this game. 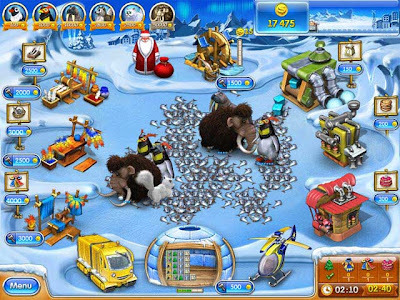 I was a little sad when the game was coming to an end until a Twitter friend asked me if I've tried Farm Frenzy 3 Ice Age, which of course got me enticed! I just checked out the game online and apparently I have NOT played this one. I can't believe I didn't know about this game sooner and I can't wait to start playing it tonight! Thanks to my Twitter friend who suggested this game to me and based on the pictures I saw online, I have a feeling I'm going to get hooked on this one as well! So if you don't see me around, that just means I'm busy playing my new game tonight. It's Sunday after all and it's raining here too ...what else is one to do on a wet weekend? so many things can be done on a wet weekend GP.. one is them is GS mah..lol! you just DL it? can i find it in the link you gave me? Yes u can Elai, and very fast too hehehehhhe! I think it's going to rain today here, too. Boooooooo. Ini game you MT ke GP? Abaden, sure la MT all da way LJ lol.. this is what I’ve been playing, best tu got Santa Claus some more for this versi, I love it! Hahha.. email me the name of the game lah.. I see.. but on no.. if I addicted how.. got so much work ni!! DH? Dah kluar ke latest one? Im finishing up S6, wah best la DH… ur up to date? I’m up to date.. waiting for the continuation!! Cant wait!